Some great Etsy news. Next weekend 30- 31st May at the San Mateo Fairgrounds in San Francisco is the Maker Faire, the biggest D I Y festival in the world. Big sponsors are Etsy, Craft magazine, Make magazine, Google, Yahoo and many more with an audience of thousands. 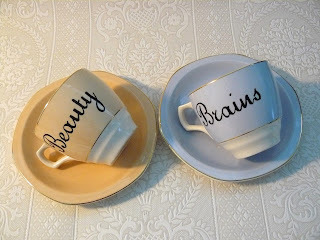 Etsy requested my Beauty and Brains cup and saucer set to join their permanent press collection for the Maker Faire so they will be displayed on the Etsy stand and used for their market displays traveling around the USA. This is a great promotional opportunity for me and I'm really excited to be taking part in this way. If you happen to read this and are planning to go please drop me a line or send me an image....I really wish I could be there!